6 Night "Once in a Lifetime"
6 nights deluxe accommodations in a luxury log cabin of your choice. Candlelight Dinner for Two. Dinner includes two ready-to-grill Rib Eye Steaks, a pair of baked potatoes (fully loaded), homemade bread, plus salad with your choice of dressing. Finish it off with strawberry short cake for desert. To drink, have a bottle of sparkly grape juice (non-alcoholic). We set the table with flowers, placemats with matching napkins, plus wine glasses. Finally, it wouldn't be a candlelit dinner without the candles. We'll set the table with two candleholders and candles that are yours to keep (Other tableware items must remain behind, please). Dozen Red Roses that really sets the mood of the cabin. Tickets for 2 to Dollywood. Enjoy the rides, the shows, the crafts and the special events that make this Pigeon Forge's most famous attraction. Tickets for 2 to the Dolly Parton's Stampede. Enjoy a dinner show like you've never seen before. Watch 32 beautiful horses and their talented riders perform amazing stunts. It's a thrilling experience! 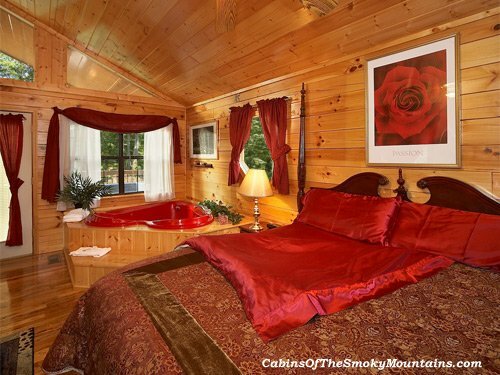 Relax in your cabin's Jacuzzi or hot tub, have an intimate dinner together, then thrill to all the excitement Gatlinburg and Pigeon Forge offer. Call 866-347-6659 for rates and availability and surprise your sweetheart today.